BACKGROUND AND PURPOSE: Spectroscopic studies (1H-MR spectroscopy) of normal-appearing white matter (NAWM) in patients with multiple sclerosis (MS) with MR imaging brain lesions have already been performed, but our intention was to investigate NAWM in MS patients who lack brain lesions to elucidate whether the same pathologic changes could be identified. MATERIALS AND METHODS: We checked 350 medical files of patients with MS who are registered in our institution. Fourteen patients (11 women and 3 men; mean age, 48.6 years; handicap score, Expanded Disability Status Scale [EDSS] 2.9; range, 1–6.5) with clinically definite MS and a normal MR imaging of the brain were included. 1H-MR spectroscopy was performed in 4 voxels (size approximately 17 × 17 × 17 mm3) using absolute quantification of metabolite concentrations. Fourteen healthy control subjects (11 women and 3 men; mean age, 43.3 years) were analyzed in the same way. RESULTS: Significant differences in absolute metabolite concentrations were observed, with the patients with MS showing a lower total concentration of N-acetyl compounds (tNA), including N-acetylaspartate and N-acetyl aspartylglutamate (13.5 mmol/L versus 14.6 mmol/L; P = .002) compared with the healthy control subjects. Unexpectedly, patients with MS presented significantly lower choline-containing compounds (Cho) compared with healthy control subjects (2.2 mmol/L versus 2.4 mmol/L; P < .001). The EDSS showed a positive correlation to myo-inositol concentrations (0.14 mmol/L per EDSS; r2 = 0.06) and a negative correlation to tNA concentrations (−0.41 mmol/L per EDSS; r2 = 0.22). CONCLUSION: The unexpected finding of lower Cho concentrations has not been reported previously. We suggest that patients with MS who lack lesions in the brain constitute a separate entity and may have increased protective or healing abilities. Multiple sclerosis (MS) is an inflammatory disease of the central nervous system causing demyelination, gliosis, and loss of neurons, mainly involving white matter.1,2 For diagnosing MS, MR imaging is widely used; lesions appear as hypo-, iso-, or hyperintense “spots” on the MR imaging scans. The McDonald criteria3 specify the application of MR imaging lesions in MS diagnosis. Cr has often been regarded as a rather stable metabolite in MS and has subsequently been used as a reference metabolite. However, such a procedure is not always justified because of complex pathologic changes in the tissue.14 A recent study has also reported diffusely elevated cerebral Cho and Cr in NAWM in relapsing-remitting (RR) MS.15 The motivation for using absolute concentrations was that a change of the ratio of 2 metabolites does not reveal which one of the 2 has changed, and during intersubject analysis, absolute quantification enables comparison of a single metabolite. In conclusion, several studies on NAWM in patients with clinically definite MS have reported increases in Cho, Cr, and mIns absolute concentrations and decreases in NAA and N-acetyl aspartylglutamate (NAAG).6,10,15 It is important to note that these reports focus on NAWM in patients with developed lesions in other regions of cerebral white matter. In contrast, our intention was to investigate patients with MS who lack lesions on MR imaging of the brain to elucidate whether 1H-MR spectroscopy elicits abnormal absolute cerebral metabolite concentrations. Our hypothesis was that these patients show the same pathologic changes as observed in NAWM in patients with MR imaging lesions, that is, a decrease in NAA and an increase in Cho and mIns. Between 1998 and 2001, the medical files of 350 patients with MS registered at the neurologic clinic of our institution were checked, and 18 patients with normal MR imaging brain scan reported in the files were identified. The MR imaging scans were evaluated by a neuroradiologist for the presence of MS lesions, because the intention of the study was to include only patients with a normal MR imaging scan of the brain.16 Four of these patients had developed brain lesions in the follow-up and were therefore excluded. Fourteen (4%) of 350 patients who were initially checked were recruited for 1H-MR spectroscopy. All of these patients fulfilled the Poser criteria for clinically definite MS (CDMS), which implicates at least 2 relapses, separated in space and time.17 There were 11 women and 3 men (mean age, 48.6 years; range, 21–62 years). Nine patients had RR MS, and 5 had the secondary-progressive (SP) form. Mean disease duration was 10.3 years (range, 4–26 years) and was longer in SP (mean, 14.4 years) than in RR (mean, 8.0 years). Neither immunomodulatory nor immunosuppressive treatment was used in 10 patients before the study; 3 patients were continuing interferon therapy during the study; 1 female patient was treated with intravenous immunoglobulins. None of the patients used steroids or had a relapse 1 month before the study. Disability ascertainment was based on the Expanded Disability Status Scale (EDSS)18 (Table 1). Mean EDSS was 2.9 (range, 1–6.5). The medical files were checked regarding differential diagnostics excluding other conditions that may mimic MS, such as neuroborreliosis, vitamin B12 deficiency, arteriovenous malformations, mass effects, systemic lupus erythematosus, Behçet disease, sarcoidosis, and neurosyphilis. All of the patients had been confirmed positive for oligoclonal bands in the CSF before inclusion in the study. Nine patients had negative MR images of the spinal cord (1 of these patients only had the cervical part of the spinal cord examined; another had 1 unspecific thoracic lesion, interpreted as probably not demyelinating; and a third patient had normal MR imaging of the spinal cord a couple of years before MS diagnosis), 2 patients had 1 demyelinating lesion, and 3 patients were not investigated (Table 1). The relapse rate of the patients during the 2 years before the study entry was rather low: only 5 patients had had bouts (Table 1). Fourteen healthy subjects, 11 women and 3 men, were used as control subjects. The healthy volunteers were recruited from the medical staff or were medical students in our institution (mean age, 43.3 years; range, 34–52 years). The study was approved by the local ethics committee. All of the patients and control subjects gave their informed consent before inclusion. MR imaging and the 1H-MR spectroscopy examinations were performed on a Signa Horizon EchoSpeed Plus 1.5T MR scanner (GE Healthcare, Milwaukee, Wis) using a standard quadrature head coil. Axial scans for evaluating the presence of lesions (∼40 sections, depending on head size), were obtained using a double-echo fast spin-echo, with 5-mm section thickness. This gave both proton density (TR, 2300 ms; TE, 14 ms), and T2-weighted images (TR, 2300 ms; TE, 98 ms). The matrix and FOV were 256 × 192 and 24 × 18 cm2, respectively. Coronal T1-weighted scans for placement of spectral voxels were acquired using a 3D fast-spoiled gradient recalled acquisition in steady-state sequence (TR, 14.1 ms; TE, 5.4 ms; FOV, 35 cm with 4-mm section thickness) using a flip angle of 20°. Point-resolved single voxel spectroscopy (PRESS) was used to obtain 1H-MR spectroscopy spectra at 63.87 MHz using TR at 6 seconds, TE at 35 ms, and voxel dimension at approximately 17 × 17 × 17 mm3 (= 4.91 mL), with a shape adjusted to the specific white matter anatomy and 64 transients. The PRESS version used was Probe-p (Proton brain examination-PRESS; GE Medical Systems, Waukesha, Wis), in which 167° pulses are used for the inversion pulses to achieve optimal bandwidth, section profile, and power usage. Water suppression was obtained using chemical shift selective imaging using stimulated echoes). 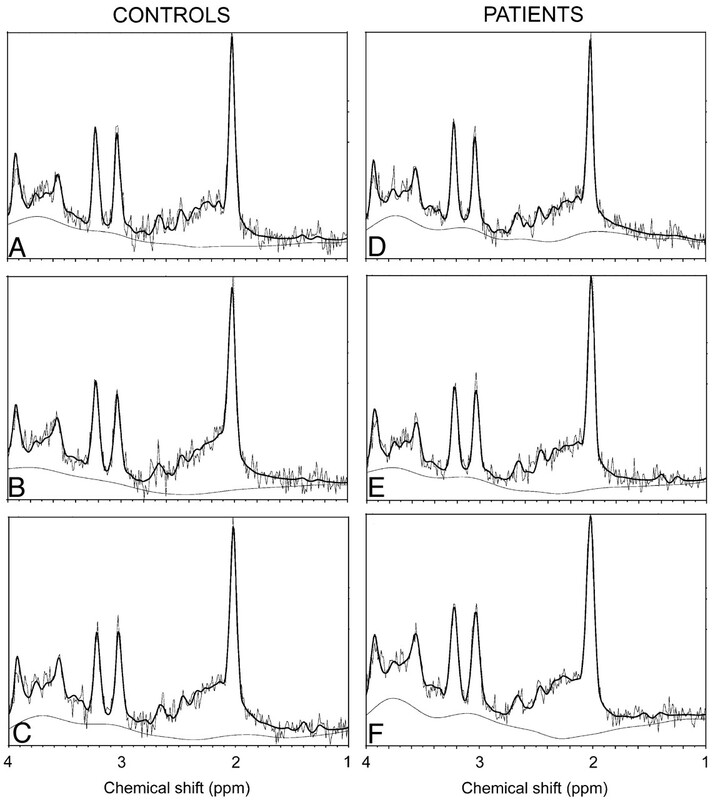 Four voxels of interest (VOIs), 2 frontal (left/right) and 2 parietal (left/right), in NAWM were identified for the MR spectroscopy examination (Figs 1 and 2). Gray matter was avoided as much as possible. 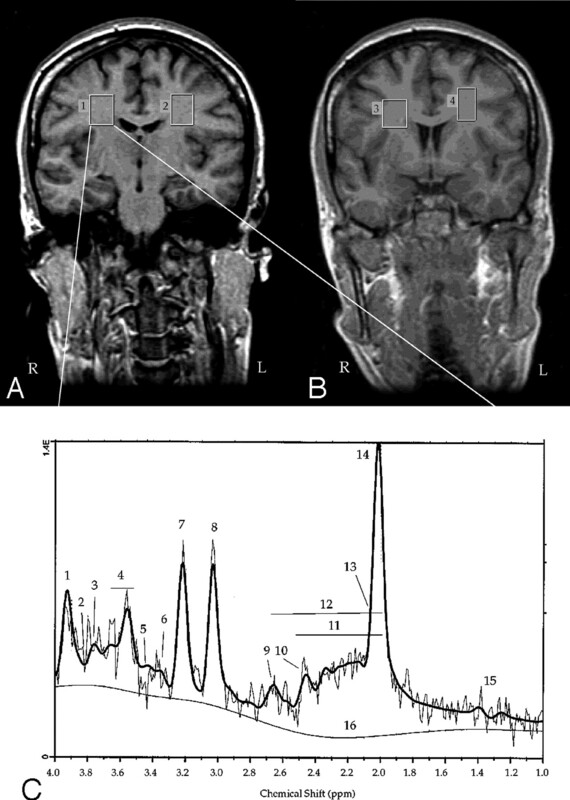 A and B, Coronal brain images (radiologic orientation) showing the standard locations of the 4 actual spectroscopy voxels in a healthy volunteer. C, The spectrum of voxel 1 (parietal right). Assignments: 1, Cr-CH2-; 2, Glu α/Gln α; 3, Gln (multiple from C2-C6); 4, mIns; 5, Gln (multiple from C2-C6); 6, scyllo-inositol; 7, Cho (CH3)3; 8, Cr (CH3); 9, NAA; 10, NAA; 11, Glu γ/β; 12, Gln γ/β; 13, NAAG-methyl; 14, NAA-methyl; 15, Lac CH3; 16, protein background (“baseline”). A, B, and C, Spectra of WM voxels from 3 different control subjects. D, E, and F, Spectra of WM voxels from 3 different patients. Vertical scale adjusted using the height of tNA. The quantification of metabolite concentrations was performed using modified procedures based on the work of Helms and colleagues,10,19 and the main modification was that PRESS localization technique was used instead of stimulated echo acquisition mode, providing a 2-fold gain in signal intensity-to-noise ratio. The most important part of the method was that the local sensitivity of the radio-frequency (RF) coil used (for both transmission and reception of RF signal intensity) was measured in each voxel. The reciprocity principle states a proportional relation between the sensitivity during transmission and reception in the nuclear magnetic resonance experiment, and based on the local sensitivity measurement, a correction factor used for scaling of the received signal intensity is obtained. Likewise, Linear Combination of Model spectra (LCModel; version 6.0–1, S Provencher, Canada) was used to fit spectra to metabolite line shapes, in addition to correcting for a common protein baseline. The following main steps were used in the procedures for subject measurements: 1) acquisition of water-suppressed spectra using a short TE and a long TR; 2) acquisition of unsuppressed water spectra as a function of RF pulse amplitude (or “transmit gain,” using the manufacturer's terminology)19; 3) acquisition of unsuppressed water spectra as a function of TE19; 4) LCModel analysis of the spectra using eddy-current artifact correction20 and a manufacturer-provided metabolite library, as well as resonances corresponding to lipid signals; 5) correction of the flip angle deviations from the desired in the PRESS sequence; 6) correction of the CSF partial volumes in the spectroscopy voxels (using the water amplitude versus TE measurements); 7) correction of the concentrations for tissue water content21; 8) correction for unequal Boltzmann equilibrium magnetization because of differences in temperature between the calibration phantom and the subjects; and 9) correction for differential relaxation between in vitro references and in vivo measurements. Data correcting for partial volumes and the reciprocity effects19 were collected for a single parietal voxel in each subject. The water spectra were collected using different transmit gains (RF pulse amplitude) and TE. The LCModel output concentration values were calibrated periodically during the study to compensate for time variability in scanner parameters using an approximately 50.000 mmol/L of Cr solution in physiologic buffer (“Cr calibration phantom”). Data were recalculated to reflect the tissue concentrations based on the water content in average white matter (71%21). Correction for Flip Angle Errors. 1) where the actual flip angle (α), was obtained from Ractual and Rideal in equation 2. 2) The RF pulse amplitude curves acquired in the subjects were fitted to equation 1 to obtain Rideal.19 The flip angle dependence (sin5α and cos5α), however, was slightly modified to account for the actual 167° “inversion pulses” used in the manufacturer-provided pulse sequence (see above). T1 and T2 values were obtained from the literature.22,23 Specifically, the following values were used: T1in vivo (in ms) Cho 1150, Cr 1550, mIns 900, NAA 1450; T2in vivo (in ms) Cho 330, Cr 240, mIns 110, NAA 450; and T2in vitro (in ms) Cho 810, Cr 765, mIns 284, NAA 945. The T1 value of the main Cr resonance in the Cr calibration phantom was determined (using an inversion recovery experiment) to be 1652 ms at 295 K.
3) where Smetabolite is the signal intensity from a metabolite, CCr is the concentration of the Cr calibration phantom, SCr is the signal intensity from the Cr calibration phantom, and Rideal is the RF pulse amplitude, which gives it the peak amplitude of the water resonance. The f(Cr) and f(in vivo) refer to equation 1 and the Cr calibration phantom and in vivo voxel, respectively. Additional Corrections for Partial CSF Volume, Differential Temperature, and T2. The correlation plot between the estimated maximum in vivo water signal intensity (SH2O,in vivo) and Rideal,in vivo for Signa LX (5.8) data showed a strong linear correlation between signal intensity and estimated ideal RF pulse amplitude (Rideal,in vivo); r = 0.97 (data not shown). This showed that the receiver parameters of the MR scanner are stable as long as the hardware is not modified. It is important to evaluate the influence of various types of errors in a study based on absolute quantification.19 The absolute quantification was performed in several separate steps, and the contribution of each of these to the accuracy and precision was subject to an evaluation, which is briefly described here. Here the data for control subjects were used for such an evaluation (Table 2). The correction for the reciprocity effect was the most significant correction (50% variation between different subjects). It is interesting to note that the other corrections (Table 2) did not alter the (population-wide) precision as expressed by the coefficient of variation (shown for 1 row of data only), which was approximately 10%. The other corrections did not alter the accuracy of the data by more than 5%–10%. The most important (other than reciprocity) correction was the differential T2 correction (approximately +8%), followed by the flip angle correction (approximately −7%). The latter arose from systematic scanner behavior. It is of interest to note that some of the corrections affect all of the measurements the same way, and their main effect is to achieve more accurate values in terms of biochemical function. Other corrections, notably the reciprocity correction, are very important for intersubject comparisons (such as patients versus control subjects). Two statistical approaches were used. First, the subjects were analyzed for intrasubject variability for each metabolite between the 4 individual VOIs in the patient and in the control group separately by using analysis of variance (1-way ANOVA). Post hoc, Fisher pairwise comparisons test was performed continuously to show which voxels differed. The Student t test was then adopted to compare metabolite concentrations in respective voxels between the patient group and the control group. In these calculations, we compared sets of data that included 14 measurements, consistent with the number of subjects in the patient group and the control group. Second, the single voxel measurements were used as a basis for analysis, according to the assumption that pathologic changes of all of the VOIs in each subject are correlated, irrespective of brain region. Thus, 56 measurements (14 patients × 4 voxels) were compared for each metabolite. Two-way ANOVA was adopted to calculate intersubject differences in metabolite concentrations between the patients and the control subjects. We also performed the Student t test to compare intersubject general concentrations of respective metabolites in 4 VOIs altogether. Statistical correlations were performed using the Spearman test. The normal distribution and equality of variances (Levene test) for each group of measurements was always ensured before ANOVA analysis. P < .05 was considered statistically significant. The absolute aqueous concentrations of metabolites in NAWM are shown in Table 3. Note that these concentrations reflect the conditions in the aqueous phase, after all of the above-mentioned corrections. The most interesting and unexpected finding was that the absolute concentration of Cho was significantly (P < .001) lower in NAWM of patients with MS than in control subjects. In addition, patients showed lower NAA (P = .003) and NAA+NAAG (tNA) concentrations (P = .002), as well as slightly lower Cr (P = .03). In contrast, no significant differences in mIns or glutamine/glutamate concentrations between patients and control subjects were detected. The concentrations of NAA/NAAG were highest in control subjects, lower in RRMS, and lowest in SPMS, a statistically significant difference, obviously progressing as the disease deteriorates. The corresponding concentrations of mIns showed a slight increase. This is expressed in Table 4 in mmol/L (SD), aqueous solution. The correlation between disability (EDSS) and respective metabolite concentrations in the patient group was also analyzed. There was a weak positive correlation between EDSS and mIns concentration (0.14 mmol/L per EDSS; r2 = 0.06), whereas a negative correlation was found for tNA (−0.41 mmol/L per EDSS; r2 = 0.22). Metabolite concentrations versus age were also investigated. In the patient group, we found a weak negative correlation between tNA and age (−0.04 mmol/L per year; r2 = 0.08), as well as a weak positive correlation for mIns concentration (0.02 mmol/L per year; r2 = 0.04). In the healthy control group, a slight positive correlation between Cho and age was observed (0.03 mmol/L per year; r2 = 0.23). No significant difference in Cho, Cr, mIns, and NAA concentrations was found between the 4 voxels in healthy subjects. The tNA concentration was higher in parietal regions compared with frontal voxels on both sides, which may be because of anatomic differences. NAAG and tNA have been shown to be higher in regions with high neuron density, such as the occipital area, compared with lower neuronal density areas, such as the frontal regions.24,25 In the MS group, there were no statistically significant differences in Cho, Cr, mIns, and tNA concentrations between voxels (right/left/frontal/parietal). We, thus, report an unexpectedly low absolute Cho concentration in NAWM of patients with MS and a negative MR imaging brain scan. Our results supported the hypothesis that altered metabolism in NAWM can be detected in patients with MS without brain lesions. NAWM is a term used to express the inability to reveal pathologic changes on the MR imaging brain scan. It has been suggested that it may not be normal, but just a reflection of the restrictions imposed by the measurement device. At higher field strength (>1.5T), it is possible that minute lesions might have been observed. Nevertheless it is quite rare for patients with MS to have a negative MR imaging brain scan. Approximately 5% of patients with MS, assigned previously to a group of CDMS according to the Poser criteria, do not exhibit pathologic changes on MR imaging of the brain. In this study we found that 4% of our patients with MS had normal MR imaging scans. In a study of patients with suspected MS and negative brain MR imaging, all (n = 20) had lesions in the spinal cord.26 The authors proposed that a combination of brain and spinal MR imaging can reach almost 100% sensitivity. Of course, this raises the question of whether MS diagnosis is plausible in case subjects with a negative brain and spinal MR imaging. In our patient population, many fewer subjects (14%) had spinal lesions (although not all of the patients were investigated; Table 1). From our point of view, the large fraction of negative spinal MR imaging in our patients (64%) suggests that there is indeed a subtype of MS with minimal demyelination. However, some of the spinal MR imaging examinations of our patients were not recent. Our main finding of a low absolute concentration of Cho in the NAWM of patients with MR imaging-negative MS was unexpected but interesting. It could indicate a lack of inflammation, but we believe that it may also be possible because of increased uptake of Cho from the free phase for the building of cell membranes (only mobile choline-containing compounds are observed under the conditions of the present experiments). If this is true, it might reflect the onset of a healing process in these patients with MS. The only report with similar findings was from Richards et al27 dealing with a model of experimental acute encephalomyelitis in primates. They described a decline in Cho concentration in animals with no lesions in voxels seen on 1H-MR spectroscopy examination, though the animals developed lesions in other regions of the central nervous system. The cause for this finding still remains unknown. Sarchielli et al28 detected no significant difference in apparent Cho concentrations between patients with MS and control subjects when investigating NAWM in patients with lesions. Aging affects Cho concentration slightly; levels increase very slightly with age in a young and middle-aged healthy population (Cho versus age; r = 0.38).29 This is consistent with our finding in the healthy control group (r = 0.48). The patient group had a slightly higher mean age compared with the healthy control subjects, but the effect of this on Cho concentration is opposite of the observed difference; the age difference can therefore not explain our results. It is possible that to maintain myelin sheath integrity, mIns can be replaced by Cho in phospholipids in the form of lecithin (phosphatidylcholine), a major component of the myelin membrane. Some subjects may have an enhanced ability to repair their myelin sheaths effectively, and they therefore do not develop typical MS lesions. It seems that as soon as the myelin sheath is irreversibly damaged, Cho concentration increases and, consequently, lesion foci develop.12 It has been reported that Cho is an essential nutrient for cell function, and deficiency of Cho leads to apoptosis.32 In addition, recent genetic research has revealed altered gene expression in NAWM in patients with MS, compared with control subjects. This should be kept in mind when considering our results. Further study, including genetic, is therefore warranted in this field. NAA and NAAG are regarded as markers of neuron cells. A decrease in absolute concentration of these metabolites reflects loss of neurons in the course of illness, either reversible or persistent.33 Interestingly, we also found significantly lower tNA concentrations in patients with SPMS compared with those with RRMS, consistent with a progression in the course of the disease. In the work by Pouwels and Frahm,24 it was shown that there are more pronounced differences in regional intrasubject concentrations of tNA than of NAA alone, comparing frontal, parietal, and occipital white matter. This variability was attributed to NAAG distribution. We, therefore, assume that NAAG is a typical marker for neuron cells, because its distribution is correlated with neuron density. In our study, we noticed statistically significant differences in tNA between control subjects and patients. It is important to note that tNA was not strongly correlated with age, as has been shown previously.29 Therefore, tNA concentration differences should not be influenced by a nonoptimal age matching between patients and control subjects. In patients with MS with brain lesions, axonal damage in NAWM is associated with retrograde degeneration of fibers transversed by the remote lesions.34 No apparent lesions were detected in brain MR imaging, but this does not exclude the presence of small lesions, which are smaller than the resolution of conventional 1.5T MR systems. These may be associated with relatively maintained myelin sheath integrity. We suggest that this might explain the observation of parallel tNA and Cho alterations. We report a lower absolute concentration of Cho in NAWM of patients with MS with a normal MR imaging brain scan. These patients may represent a subtype of MS characterized by an increased ability to protect against or a decreased ability to form lesions. Thus, 1H-MR spectroscopy may help to elucidate the metabolic variability in MS patients with different clinical expressions. Dr Gunther Helms (Karolinska Institute, Sweden) is acknowledged for taking part in the discussion and providing the reference by Richards et al.27 MR Technologist Jens Engström is appreciated for skilled assistance during patient scanning. Radiologists Tomas Hindmarsh, Håkan Lindstam, and Leif Davidsson are gratefully acknowledged for expert radiologic advice. Drs Declan Chard and David H. Miller at Queen's Square Neurologic Centre in London are gratefully acknowledged for their advice and support. Drs Gustafsson and Dahlqvist contributed equally to this work. This study was financially supported by the University Hospital in Linköping, including University Hospital Research Funds. Accepted after revision January 9, 2007.